Researcher, as of May 1, 2018 no longer employed at NIDI. Migrant family matters. 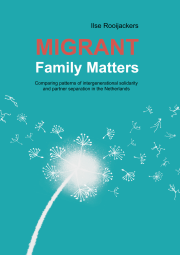 Comparing patterns of intergenerational solidarity and partner separation in the Netherlands. PhD Thesis, University of Groningen. 183 p.